11:11 photobomb! What does it really mean? Kris and I had counselling with Caroline Byrd (my spiritual mentor) last week, partly because I keep taking photos of numbers (?!) We agreed that I need to be more present. So I said today, hold off the 11’s until after breakfast. No luck!! 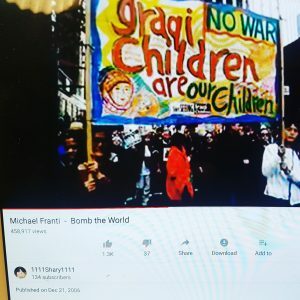 Felt the need to Google Michael Franti’s ‘Bomb the World‘ and the user’s name was 1111Shary1111. Plus, they posted it on 21.12 which is an energy portal. And Michael Franti is a 29/11 lifepath like me…no wonder I love his lyrics ‘you can bomb the world to pieces/ but you can’t bomb it into peace’. Oh yeah, and breakfast adds to 11…it really is the most important meal of your day. Blah! I give up. This is my magical reality. So…If you see 11:11 and accept the mission by meditating and educating yourself, this could be your future – constant miracles and helping hands from Spirit, plus a complete loss of your fear of death. Cool, huh? 11:11 means that you are a multi-dimensional Soul with many second chances.